You’ll participate in an array of sessions, interactive training and debates at the AHA/ASA’s International Stroke Conference 2018 on Jan. 24-26 at the Los Angeles Convention Center. But there’s even more at ISC. Be sure to also check out Unofficial Satellite Events and Expert Theaters. The events are independently organized by exhibitors, universities, nonprofits and industry supporters to provide prime opportunities to learn about the latest scientific advancements, and the theaters are settings to discover the newest products and services for stroke specialists. Unofficial Satellite Events are not a part of the official International Stroke Conference planned by the ISC Program Committee. 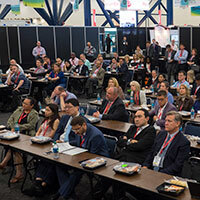 Sessions in the Expert Theaters feature new stroke products and therapeutic treatments presented by industry supporters. The ASA will provide a complimentary lunch.